One of the things that I use my Thermomix for quite often is steaming. I know that some people don’t even use their Varoma dish (steamer), so hopefully this will inspire a few of you. The Varoma name comes from Vorwerk (the company that design and manufacture this amazing product) and is a made up work combining the two things that occur when steaming. Vapour comes from the bowl through the steamer and Aroma is emitted, hence Varoma :). The dish itself has two layers and has (up to) a 2 L capacity. There is so much more. I hope you enjoy this recipe and adapt it to suit your household. 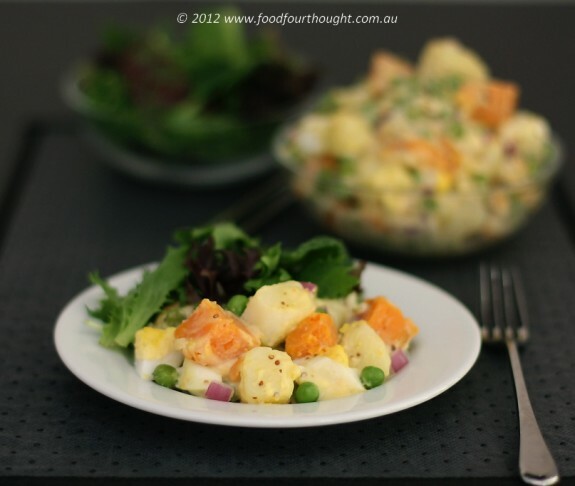 potato salad with seeded mustard mayonnaise (recipe by Fiona at Food 4 Thought). Pour eggs into TM bowl, add dijon mustard and salt. If the eggs are from the refrigerator, heat on 37°C for 1 minute, speed 3, otherwise mix for the same without the heat. Ensure the MC is on the lid with the opening facing up and the lid is secured in position. Set scales to zero and pour (and weigh) the vinegar into the MC. Turn the dial to speed 4. Pour the oil onto the lid (being careful that it doesn’t overflow) and allow it to drip into the bowl until it is all gone. Without stopping the blade, remove the MC and pour the vinegar into the bowl. Mix for a further 10 seconds. Stop the blade, add the seeded vinegar and mix for 5 seconds on speed 3. Check for seasoning and adjust as necessary. Pour mayonnaise into airtight container and store in refrigerator until required. Place water into TM bowl. Add simmering basket with eggs. Add mixed potatoes into the Varoma dish, leaving the top layer out. Cook at Varoma temperature for 15 minutes on speed 3. When finished, remove Varoma dish, set aside. Use the spatula to remove the basket and run the eggs under cold water before peeling. 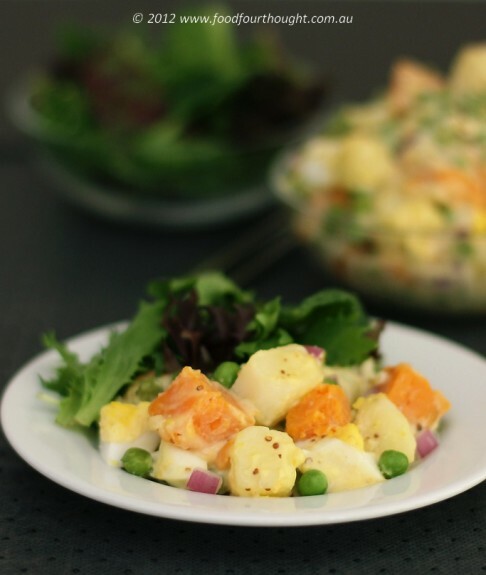 Stir the potatoes to encourage even cooking, add the top layer into the Varoma dish and add the peas. Place the dish back in place and cook at Varoma temperature for 10 minutes on speed 1. In the meantime, chop the onion, peel the eggs and chop into pieces the same size as the potatoes. Add to a large salad bowl. Once completed, check the peas are cooked and the potatoes are soft when pricked with a fork or knife. They should not be falling apart but just soft. Add the potatoes and peas to the salad bowl. Pour over the mayonnaise and stir gently to combine. Taste for seasoning and adjust as desired. My tips: *I always use ruby lou or royal blue potatoes as I find they hold their shape better and do not break apart. *You can substitute beans and spring onions if you prefer and even add some crispy bacon for something different. *If you find the mixture too thick when the mayonnaise is added or you would like to add a little less mayonnaise, simply add a tablespoon of the cooking water. This will loosen it slightly but still keep it creamy due to the starch content. *I prefer to dice my onion in this case than use the Thermomix because I want it to be uniform in shape. taste: 9/10. We loved this salad. Everything just worked so well together.